This Hostel is right in the middle of one of the old city parts which is must see. Still, the hostel is quiet and very comfortable! There even is breakfast in the nice Restaurant next door included! Really recommend this place! Hostel in Toplage und sehr ordentlich, nette Mitarbeiter und es gibt viele Tour Möglichkeiten sowie Ticketservice. Frühstück auch sehr gut, allerdings gab es immer das Gleiche (Toast, Butter, Ei, Speck, Melone) in den 5 Tagen die wir dort waren. Würden dort wieder hingehen! Ein wirklich schönes Hostel in bester Lage, sowohl mit Bus, als auch mit der Metro kommt man überall unkompliziert hin. Die Straße in den Hutongs ist wunderschön, zwar etwas touristisch, aber auch perfekt zum Stöbern und Snacken und Sich-Treiben-Lassen Toll fand ich die perfekt ausgestattete Küche, den 24h-Heißwasserspender, das gute WLAN und die Vorhänge bei den Einzelbetten im Viererzimmer, die etwas Privatsphäre boten. Ich würde auf jeden Fall wiederkommen! Nice hostel. 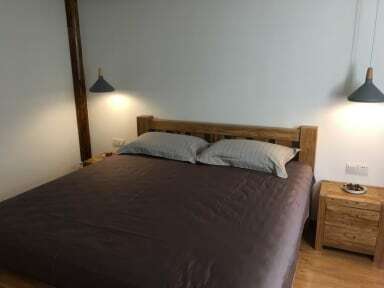 Here some more details: Pros: Rooftop terrace, hutong location, beer 6rmb, kitchen, nice rooms Cons: Atmosphere can be improved but I guess this highly depends on the other staying travellers since the shared rooms are awesome. 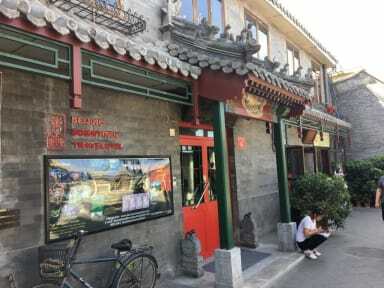 The hostel is right on the tourist street but it takes you 30 minutes by metro to reach the forbidden city. The rooms are big and clean. The staff can speak english an can book train tickets for you (you have to pay a little bit for it but you get the ticket the next day so you don't have to go to the ticket office) you don't get your own key so you have to ask the staff every time to walk with you to your room to open the door. Wlan doens't work on the rooftop but it's quite good in the dorms. It was a nice Stay. The toilet got cleaned after 6 Days for the first Time. I had to go down everytime for toilet paper. But the rest was really good, specially their Tour to the Great Wall of China. Der einzige Kritikpunkt wären die fehlenden Handtücher, ansonsten sehr nettes Hostel. Es gab keine Möglichkeit, das Zimmer abzuschließe und die Atmosphäre war nicht sonderlich gut. Allerdings war es sauber und ruhig. Basic accomodation in the center of town. Very, very bad breakfast. I mean, quite the worst I ever had. Female staff unfriendly.